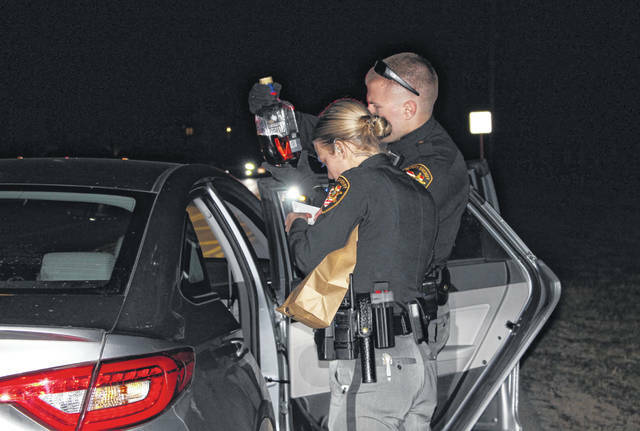 Delaware County Sheriff deputies Rachel Wooten and Josh Bender investigate a drunk driver call in 2018. The Delaware County Sheriff’s Office is looking to grow and expand in 2019 to meet the needs of the county. Looking back on 2018, Delaware County Sheriff Russell Martin said offense reports went up in 2018 from 6,140 to 7,412, but he added there were no major trends in reports taken. Martin said on the drug front, the county saw an increase in drug overdoses in 2018, from 114 in 2017 to 143, and the number of overdose deaths also rose from 19 in 2017 to 22 in 2018. However, Martin said Narcan “has had an impact” on overdose deaths, and he praised the work of medics and law enforcement administering the drug in the county. According to Martin, the Delaware County Drug Task Force seized 7,314 grams of heroin in 2018, which is enough to kill 40 people on average. He added the drug task force continues to analyze drug trends and respond appropriately. Looking back on 2018, Martin said he’s very proud that the capital campaign has successfully concluded for Delaware County’s Turning Point domestic violence shelter. Martin said the recently completed facility is hiring and training staff, and it will begin taking clients this month. Looking to the future, Martin said he recently presented a three-year strategic plan for the sheriff’s office to the Delaware County Board of Comissioners, and it includes hiring additional deputies, adding oppotunities for promotion and more supervisors, and expands support services for community engagement. “The challenge is to continue to grow the office to keep up with the county,” Martin said. Martin added when he took over the position of sheriff in 2012, he was focused on culture, but since his election to the position in 2016, he’s looking to expand the facilities for deputies. Martin said the office is currently split between the administration building on North Sandusky, the jail on U.S. Route 42, and a small office on U.S. Route 23. He added the deputy facilties at the jail make it difficult for a deputy to even come back to the office to get cleaned up.